You’ve likely seen this on social media. 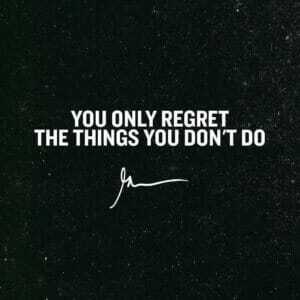 Or you’ve heard someone quote Gary Vaynerchuk (@garyvee). I’m guessing you’ve seen him on YouTube or Instagram. He’s the kind of a whole bunch of inspirational messages about hustling. And a lot of it inspires you. So it’s rare that I write a post that refutes his logic. But that’s what I’m about to do. Because deep down, I don’t think this is what we’re going to regret on our deathbed. I don’t think we’ll be there, years from now, thinking about all the missed opportunities. Maybe it will happen. But I don’t think that’s what I’ll regret. And if you’re honest, I don’t think that’s what you’ll regret either. You know what we’ll regret? All the things we spent way too much time doing. All the time we waisted doing things we thought we should. All the effort we spent comparing ourselves to others. We’ll regret our poor choices investing in things that weren’t worth it. That’s what I think we’ll regret. I’ll be honest, I’m already there. I don’t need to wait until my last days to look back over the last few years and see the time and energy spent on the stuff that I no longer find valuable. I’m not so worried about the things I haven’t done. I’m frustrated by the way I’ve wasted time and energy on poor life choices. “Mistakes have been made,” is something I’ve said too often. So while I appreciate the inspiration from Gary, I want to challenge you in a different way today. Instead of making a “to do” list, start making a “won’t do” list. That’s the way to protect yourself from future regrets.